With the 2016 school-year just around the corner, you may want to review content on the Limbs 4 Kids website and/or download related Fact Sheets. These pages provide general information about early childhood learning, primary schooling and secondary schooling; as well as information specifically related to the education needs of children with limb differences. 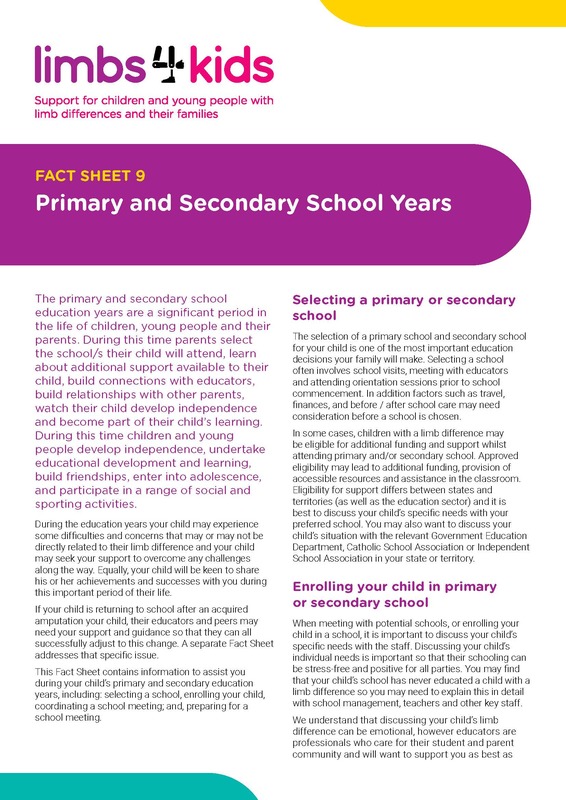 Some specific resources look at enrolment, preparing for school meetings, returning to school after a limb amputation and tips for assisting fellow students to understand limb difference. For more information visit the ‘Education and Employment’ section on the Limbs 4 Kids website. You may also want to download specific Fact Sheets (in the publications section of the Limbs4Kids website) that can then be shared with others, or get in touch with Limbs 4 Life to request for hard-copies to be mailed to you.